LoveToKnow had the opportunity to interview Christa de Leeuw van Weenen about her wonderful line of rubber purses at Zuss Fashion Design. The company was started by Christa and her sister, Krijnie in 1997. For the past two years, Christa has been running Zuss Designs by herself, but the spirit of two sisters creating art from old innertubes can still be seen in the original designs of these fun spirited purses. 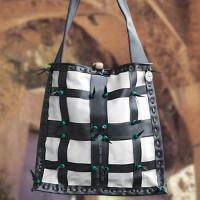 LoveToKnow (LTK): Rubber clothing and handbags! 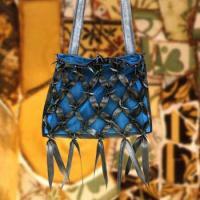 I absolutely love the concept of a rubber handbag and reusing materials. Can you tell us a little more about your handbag line and the overall concept? Christa de Leeuw van Weenen (CLW): Every handbag is a piece of art. It is made with a lot of love and becomes a unique and original piece. 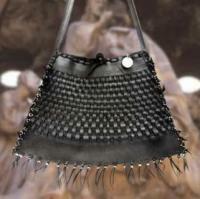 Even if we tried to make an exact copy of another purse, the innertubes won't allow it. Although all the innertubes may be exactly the same when they are brand new, each lives a separate "life" that makes it unique and different, just like every human lives a life that makes her unique and different. LTK: What are some of the other accessories and jewelry that you offer? 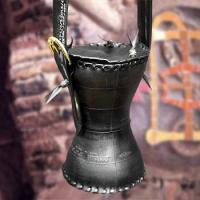 CLW: Zuss Fashion offers neck and arm decorations, belts and hats. CLW: The adventure started with a skirt and top made from a bicycle innertube. When that turned out well, we began to wonder how far we could take our designs. What else we could make from used inner tubes. Later on, we tried using different types of innertubes, such as moped and car tire innertubes. We created these things for the love of art, without a plan, and had no real idea if people would like the designs or want to wear them. LTK: Where in the world did you come up with the initial concept of using rubber? It's quite a unique idea. CLW: In 1997 I attended a symposium from a University about rubber. I saw artists there working with different types of rubber and technics. One of the artists had sewn together used innertubes from bicycles. I fell in love with the look and feel of the material. I made a decision not to use machines to create my items. If there comes a time when one can no longer use machines, people can still recycle materials and use ancient technics such as the Indians used. Because every piece is handmade, every piece is a unique and original piece of art. Every hole, every bit of lace, every knot that is tied is all handmade. The only tools we use are our hands, a hole punch, scissors and imagination. There is no glue and no sewing involved. At first, making the innertubes into something wearable seemed like a challenge. So, I designed some pieces and wore them to parties. This also helped me gauge other people's reactions to the designs. The response was overwhelmingly positive, so we moved forward. My older sister, Krijnie, asked to join me in my venture. We had our first show in Harderwijk, our hometown. We worked together for ten years, building Zuss, but in 2007 Krijnie decided to retire. Working with the material requires a lot of hours and heavy labor and my sister was almost 70 years old. LTK: Where do you find the ideas for your designs? CLW: Partly from the material itself; its round, sturdy shapes cannot be altered, you have to work with it. But also from our fantasy, lives, and traveling the world. The great challenge is to combine our fantasy and the restricted forms of the tubes. LTK: Any plans to expand your handbag line? CLW: We always felt the freedom to create whatever and whenever, we had no structural plan forehand. But my sister Krijnie had a special love for handbags, so she made a lot of them. You must realize every piece is unique, all handmade. Since we have no set patterns, and since the work is more like creating sculptures than anything else, I have no idea what the future holds. LTK: What can we expect to see from Zuss bags in the near future? CLW: At this moment a new idea is born to connect the pieces of rubber with crochet. So my best friend and I are searching for an organic material, like hemp and nettles. But not only for handbags, also for clothes and whatever we can think of. Stay tuned, because in the near future we will introduce a new line and a new friend. LTK: Is your biggest audience those who love rave, gothic and punk, or do you find that your customers come from all walks and personalities? CLW: Zuss lovers come from all corners; ravers, goths and punks, from architects to artists, musicians, and art lovers, like people who go to Burning Man. Because of the diversity in designs, I guess. A person who would never wear clothes of rubber, feel themselves drawn to a handbag, or a bracelet, for example. CLW: Above all; Zuss is about recycling, not about making money or making design conform to the rules. For handbags, it means they have no inner lining or zippers. I'm proud that Zuss appeals to everyone from young children to adults. I get emails from around the globe talking about recycling or life philosophies. Because the hours of labor involved in making the handbags are so great, I cannot live from Zuss. I work two other jobs. Zuss is a labor of love. LTK thanks Christa for taking the time to talk about her amazing concept. You can purchase Zuss rubber purses at Zuss.com.